Johnston Canyon is one of the best things to do in the Banff area during your stay in the Canadian Rockies and is also a great spot for photography. It is easily one of the most popular day hikes in Banff National Park so read on as I will be talking about some things to look out for when photographing the Canyon, providing you with some more knowledge of the area, as well as some useful advice to make the most of your visit. 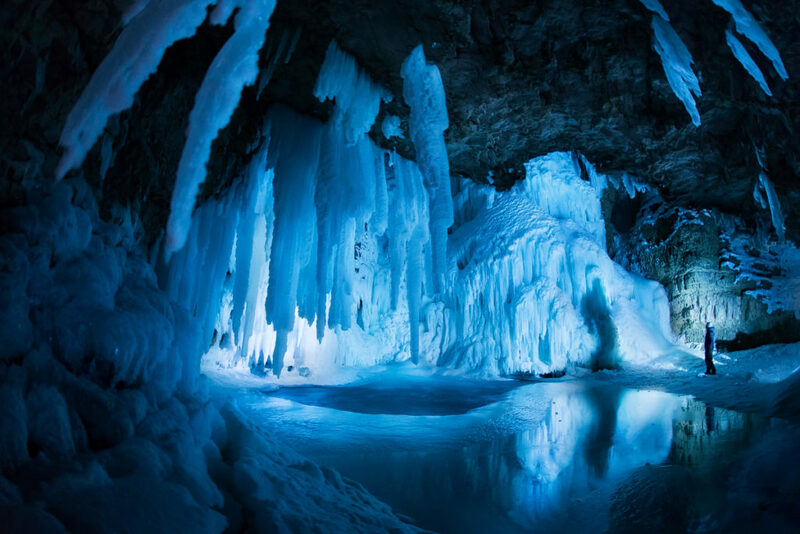 Johnston Canyon is located 25km (16 miles) from Banff along the Bow Valley Parkway (1A Highway). The quickest way to get from Banff to Johnston Canyon is to exit off the TransCanada Highway onto the 1A shortly after leaving Banff heading towards Lake Louise and following the signs to Johnston Canyon. 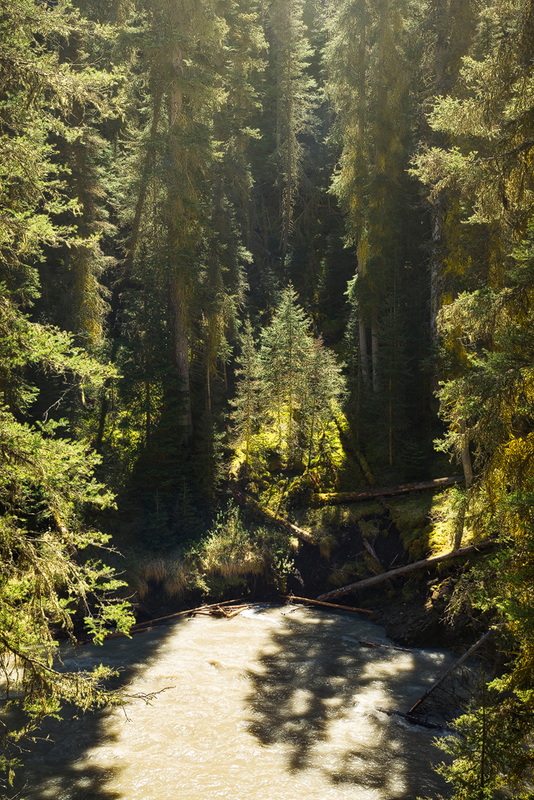 Johnston Canyon can get very busy especially from June – September and on weekends year-round but there are many quiet moments to be had if you go early in the day or mid-week. I would suggest photographing sunrise at Castle Junction or Moose Meadows (which are closely located together about 5 minutes to the North of Johnston Canyon along the 1A HIghway) and then going directly to Johnston Canyon to get nice morning light filtering in and when you can sometimes even have it all to yourself. It is also perfect for a grey cloudy day too which will make it even easier to photograph in the Canyon due to the reduced dynamic range of the scenery (the light won’t be as harsh or high contrast which is easier for our cameras to handle). 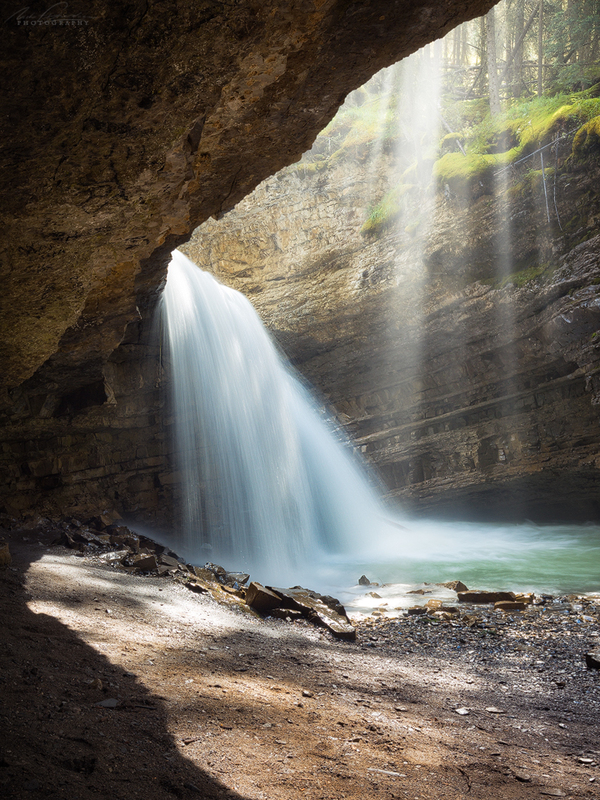 Either way you will find it a very worthwhile thing to do while you are visiting Banff as there are seven waterfalls hiding within the Canyon! Marguerite Falls, one of seven distinct waterfalls within Johnston Canyon. In 1926 Walter and Marguerite Camp purchased what is now Johnston Canyon Resort which had an existing trail to the Lower Falls at the time. Soon after they discovered 6 additional waterfalls while exploring further upstream from the Lower Falls. Great news for photographers today, although at the time it was used as a selling point to further develop the infrastructure and trails in order to show it off to visitors of Banff National Park where even back then it was one of the best things to do in Banff! And the tallest of the seven, the 30m/100ft tall Upper Canyon Falls – 2.6km/1.5 mile one-way (1 hour). Once recorded as Mistarry Falls – bit of mystery though as to what happened to that name. There are two vantage points here – the lower one accessed along a cat-walk, and a higher one you can find as you proceed uphill along the signed trail towards the Ink pots. Allow yourself 2 – 2.5 hours round trip to visit the whole length of Johnston Canyon all the way to the Upper Falls and back (5.2km/3 mile). If you are keeping your eyes open for unique compositions or lighting and being patient in order to truly see some great photos give yourself longer! 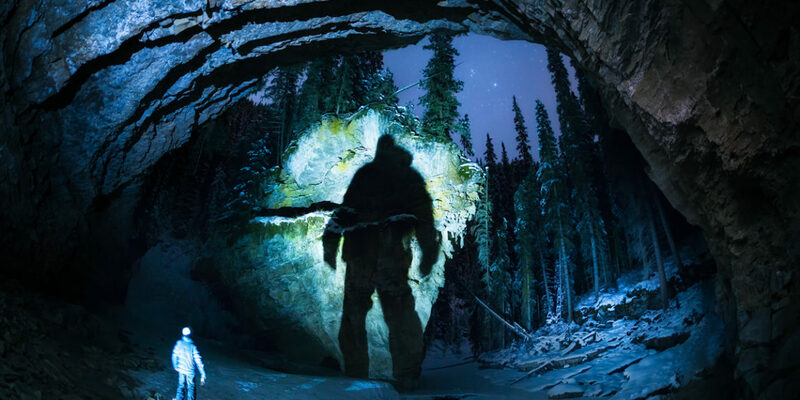 As one of the best things to do in Banff make sure you can capture that experience in the most creative way possible by reading on for what you should bring for taking your best photos yet. Bring a tripod in case you want to blur the water in the canyon and experiment with varying shutter speeds. Bring a polarizer which can serve two purposes, to slow down your shutter speed by 2 stops which is often enough to get around the magical 1/6th of a second shutter speed that I like (creating a smooth, yet textured appearance to water flow), and secondly to polarize the light coming into the canyon. This can cut glare from the water’s surface allowing you to better photograph the blue/aqua/emerald hues of it flowing through Johnston Canyon. Make sure to rotate the polarizer ring when using it as the effect is only present when rotated into the correct position according to your angle relative to the sun. 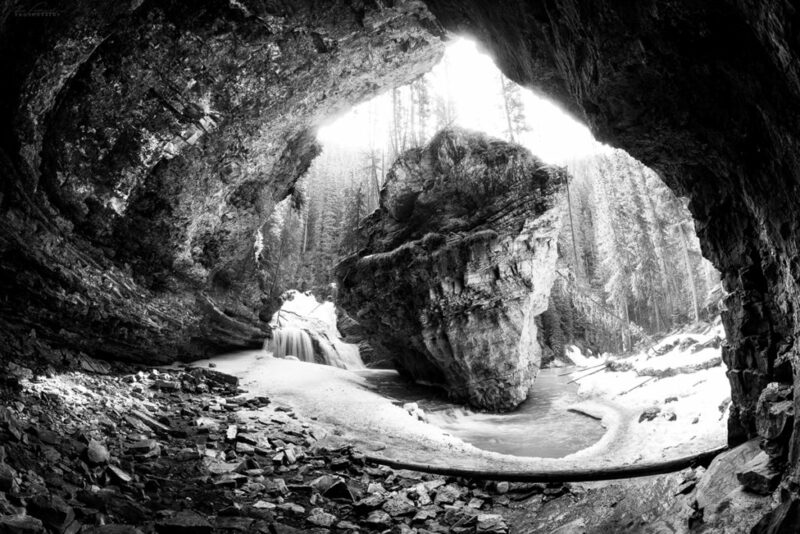 Bring your widest lenses (even a fisheye if you have it) as you can better show off the depth of Johnston Canyon and give scale and sense of place with something 20mm or wider on a full frame camera. Also bring your telephoto lens, anything up to 400mm on a full frame camera as you will be on a trail most of the time with restrictions on how close you can get to the water so it really helps to be able to zoom in and photograph details along the edge of Johnston Creek. In combination with a tripod you can come away with some very cool abstract water flow photographs. 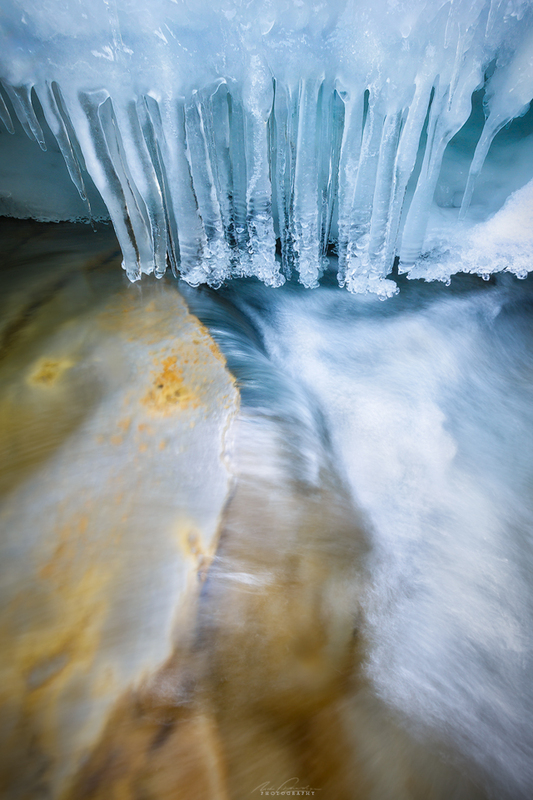 Bring an ND filter if you will be visiting Johnston Canyon in the middle of the day. A 6 stop or even a 10 stop ND filter will help you still achieve slow shutter speeds and blur water at these times. If you time your visit for when the sun is peaking into the canyon you can photograph mist, waterfall generated rainbows and light rays. Bring a small towel to cover the camera or dry it off if you choose to get close to this type of action. Lots of lens wipes as well. These photos can be very dramatic. The harder it is to shoot and more uncomfortable you get in these water spray scenarios can also yield incredibly powerful and unique shots. Wear rain gear if going all in for the shot, especially in spring and early summer when the water flow is at its peak. Go Early – No crowds and the best lighting! Bring water and snacks for when you get lost in the moment searching for great photographs and the time gets away from you. 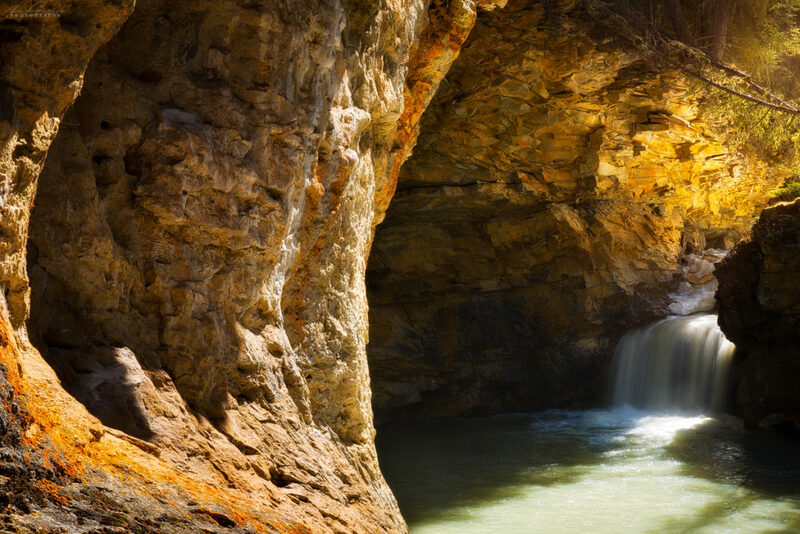 Johnston Canyon is a great place to visit in the Banff area year-round. Each season has its photographic upside as well as some things to consider. Spring (Light from 6am-10.30pm) – An explosion in water flow rates and volume begins in May and continues through June. This is my favourite time to visit Johnston Canyon as well as thing to do in Banff in spring as summer crowds haven’t quite struck, it’s very green, and you can experiment with very fast shutter speeds freezing water splashing off the walls of the canyon, showing off the power or water instead of the subtlety of silky smooth water on a long exposure. ** Be warned it can be muddy on the trail in Spring and the water can be brown carrying sediment from higher up in the mountains – good footwear is essential. Be safe, and stay on trail due to the high water flow. Make use of the telephoto and watch for light rays in the extra mist. Summer (Light from 7am – 9pm) – Avoid the Canyon unless coming early or late in the day as summer crowds are large. The trail is drier, the water color takes on its natural beautiful blue, emerald hue, and you can start to get a bit closer to the water flows without getting wet. The most postcard pretty time of year so it should be on the bucket list of things to do in Banff in summer (along with a ton of other spots!). Fall (Light from 8am – 6pm) – Very quiet on the trail, fall colours are present on the hillsides around the trailhead which are especially visible at Hillsdale Meadows just South of Johnston Canyon on the Bow Valley Parkway. Water flow is at its lowest allowing you to go and see some of the polished rock smoothed from the constant erosive forces of the water cutting through the limestone walls of the canyon. 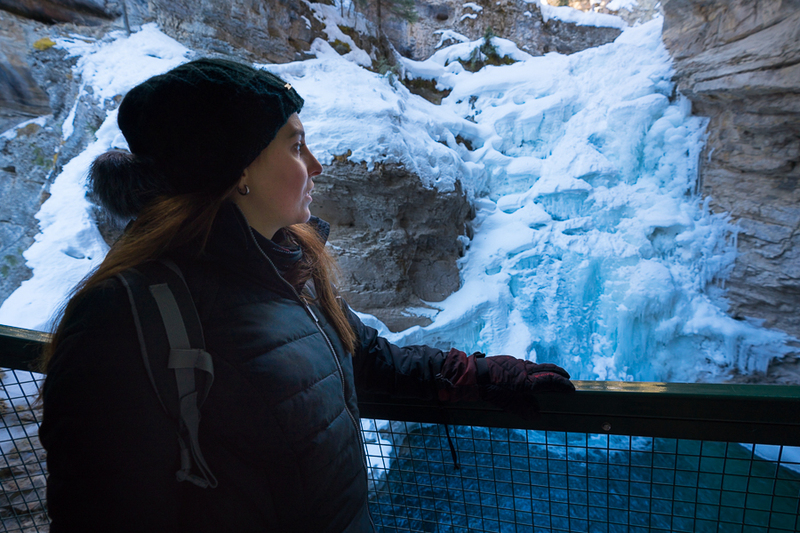 Winter (Light from 9am – 5pm) – The longest season at Johnston Canyon but magical especially after fresh snowfall when the trees are full of snow contrasting against the bare rock or blue coloured ice formations. If you want to try some more adventure based photography try it out on the ice climbers at the Upper Canyon Falls. Photographing ice formations is one of my favourite things to do in Banff and Johnston Canyon is one of the best spots to do it but there are also some amazing locations nearby too (Investigate Marble Canyon in Kootenay National Park, it is 20 minutes drive from Johnston Canyon, just over the border in British Columbia accessed on the 93 S Hwy from Castle Junction heading West towards Radium Hot Springs). I also have much more information on Banff National Park as well as Banff photography tours, workshops & adventures which you can hear about first by signing up to my mailing list below. I look forward to sharing all the great things to do in the Banff area with you!